. .. Guests save up to $1000 per suite! Select 2017 Fall voyages also included! Traveling between Vienna and Budapest, these new 7- and 11-day voyages bring Crystal’s enriching Experiences of Discovery® aboard The World’s Most Luxurious River Cruise Line™. Former US Ambassador and founder of Susan G. Komen®, Nancy Brinker, and Crystal CEO and President Edie Rodriguez, will each host a 7-day voyage, while an 11-day May voyage will explore "Jewish Heritage" sites with multiple overnights in Vienna, Passau, Linz and Budapest. Book by September 30, 2017 and enjoy Early Booking Savings of up to $1,000 per suite — a reward we are extending on various late 2017 voyages, too. 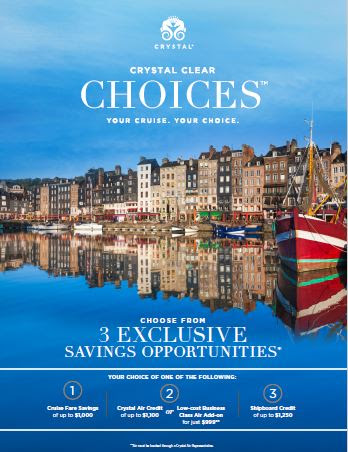 Crystal Offers an Array of Voyages for Everyone's Tastes. Perfect choices for groups! Ocean and River Cruise Options.